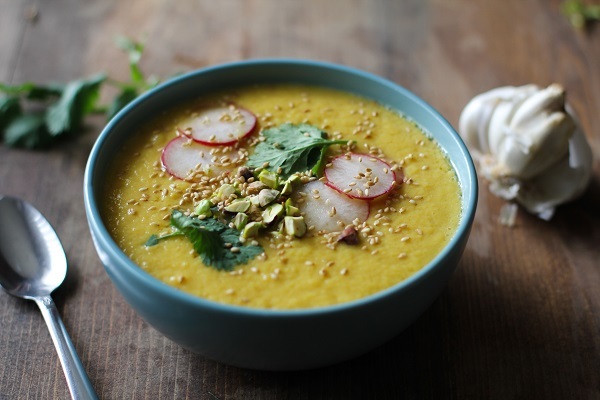 Golden Beet and Fennel Soup – an earthy creamy healthful soup. 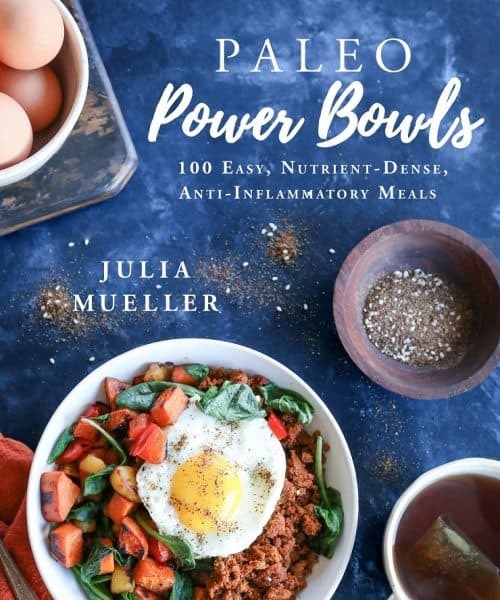 full of nutrients and fiber. Have you noticed that there is no recipe for borscht on this blog? Nonsensical, I know. 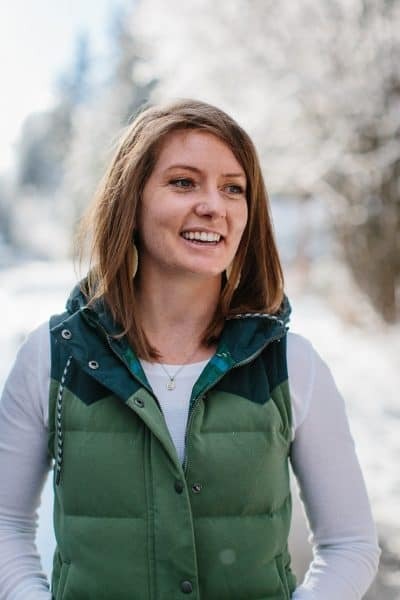 Beets are the poster child for this site, and yet I’ve never exhibited one of the most world renowned ways of preparing red beets. I have no clue why. That’s not true. I definitely know the reason. You guys, it’s the color. There, I said it. My talent for photographing red food is sub-par. Why do you think you rarely see tomatoes on The Roasted Root? It’s because red and I have a torrid relationship. But good news! 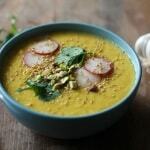 : Not only is this golden beet soup not red, it also hits the spot on a cold winter’s day. BOOMshakalaka! PLUS, I have to admit, there’s something about borscht that says to me, “American Horror Story.” not “wholesome bowl of soup #slurp.” So there is that. Recently, I was flipping through Cooking Light’s December issue and spotted a golden beet and fennel soup recipe that jumped up and bit me on the shnoz in the classiest of ways. The soup turned out fabulously, I mean just look at the thing! All this talk about beets makes me want to talk about chicken. Flavor-wise, my version of the recipe turned out tasting like creamy chicken soup because I used chicken broth instead of water (which is what the original recipe calls for). I found this flavor to be absolutely delightful, but if you’re looking for that pronounced earthy/sweet fennel and golden beet flavor (and/or to keep the recipe vegan), you can replace the broth with water. Un-borscht beet soup. We’ve got this! In a large stock pot or dutch oven, add the oil, fennel, chopped beets, and garlic, and heat to medium. Saute, stirring occasionally for 10 minutes. Add the salt, turmeric, and red pepper, and saute for another 2 minutes. Add the water (or broth) and wine and bring to a full boil. Reduce heat, cover, and simmer for 40 to 50 minutes, or until beets are tender. While soup is cooking, combine the sliced radishes with the lemon juice and salt in a small bowl. When soup has finished cooking, transfer it to a blender and blend until smooth. 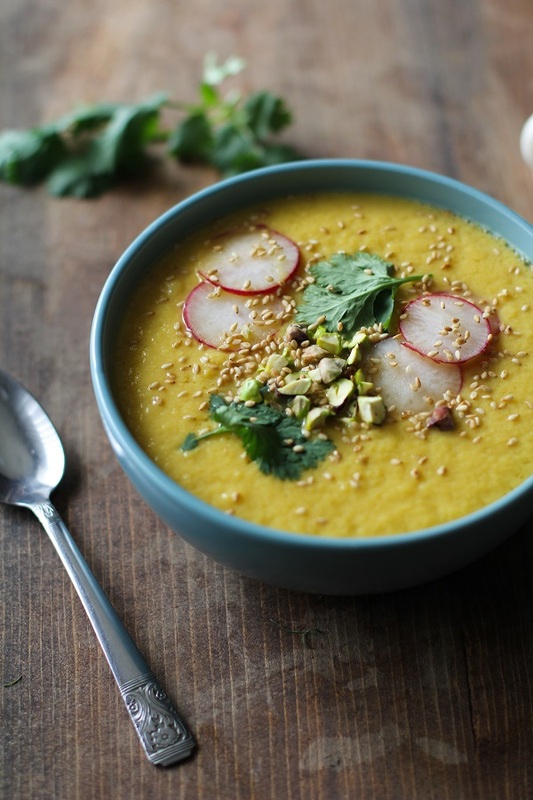 Serve soup with sliced radishes, chopped cilantro, sesame seeds, and/or pistachios. THE COLOR OF THIS SOUP. Speechless. It’s 10 am which means it’s practically lunchtime and a bowl of this soup would be perfection. What a gorgeous soup! It sounds delicious, and I adore the color. Amazing! Pinned 🙂 happy holidays! The radish, cilantro and lime remind me of bahn mi. I wonder how a little chili oil and sliced jalapeño would go with this soup? I’m hoping my local market has golden beets for me today! Cheers and Happy New Year! This looks so delicious – I love all the toppings! Wishing you a wonderful new year Julia! 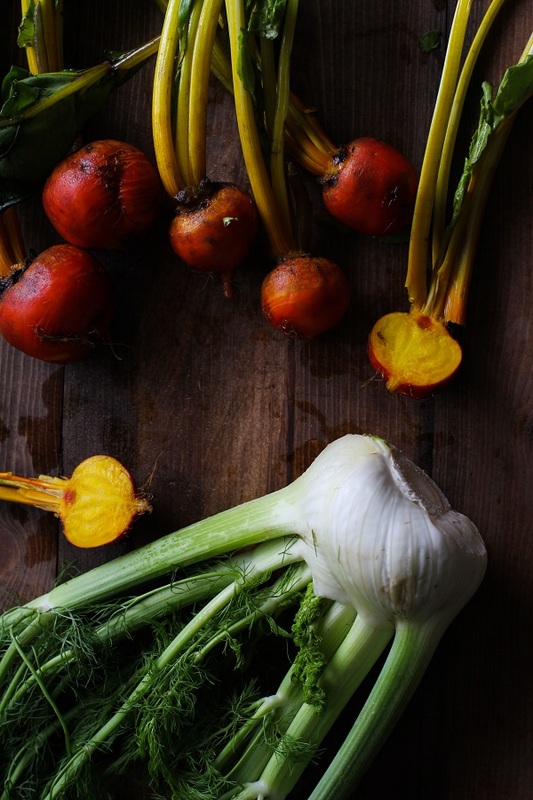 I can’t believe I haven’t tried beets and fennel together outside of a salad! Completely obsessed wit this and pinning it to make later. I love beet soup. It’s so earthy and yummy in my tummy. And yellow beets are far less messy and potentially clothes ruining, so I’m down with that! Ugh, these photos are so gorgeous! I’m sure that the whole red thing is all in your head but this soup sounds better than borscht anyways. Cheers to 2015 girl! 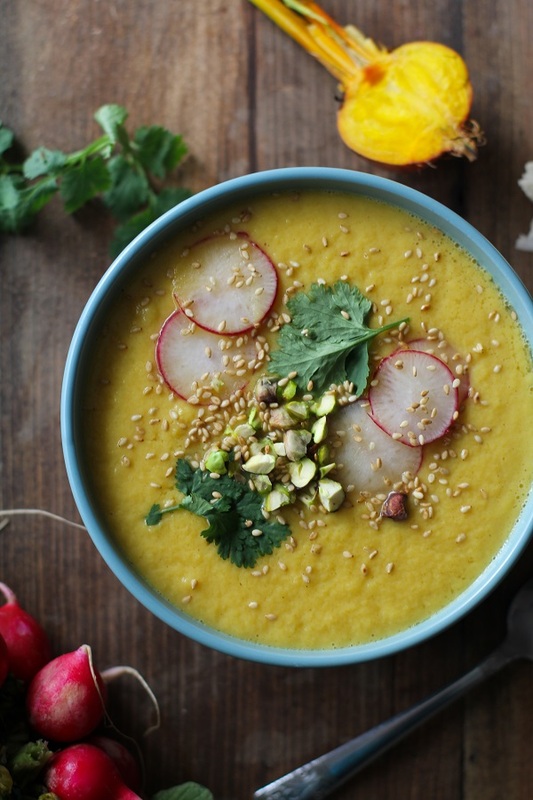 I’ve never had golden beets, but ths soup is so pretty! Love the color! Ummm this is one of the most absolutely gorgeous soups I’ve ever seen. And I don’t like beets OR fennel. I love beets but never have tried golden ones before! This soup looks beautiful and I definitely am curious to know what it tastes like.. Thank you for sharing this recipe. This is by far one of the most flavorful and beautiful soups I have ever made. It goes to the top of my list. This soup is amazing. If you’re not addicted to borscht, you’re not making it right. Can you please clarify the red pepper ? in the recipe? I’m not sure what kind or the quantity. Hi Wendy, I use 1/4 teaspoon of red pepper flakes. Hope you enjoy!